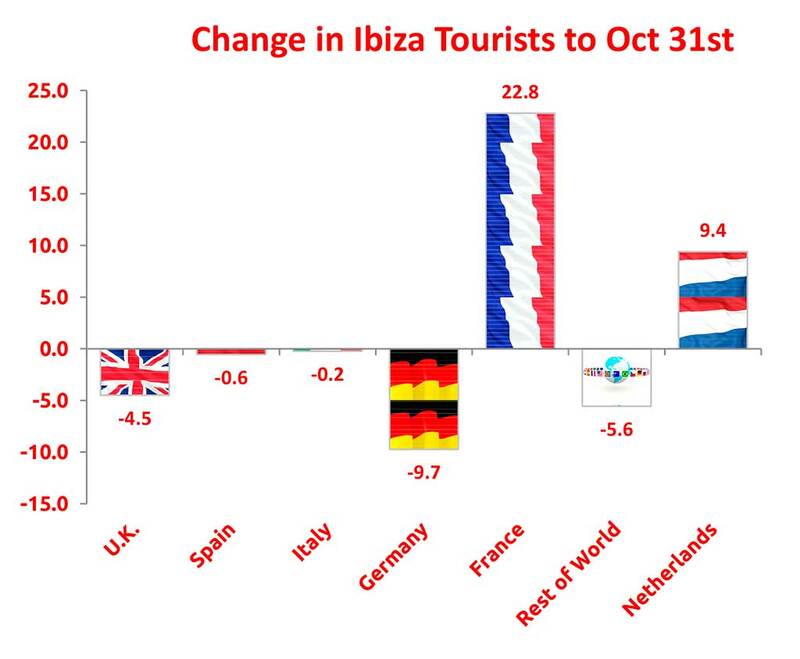 The Frontur official tourism figures are in to the end of October – and so covering Ibiza’s entire summer season. Despite all news of panic and collapse circulating throughout the year, the figures show a drop of just 1.2% compared to the same period in 2017. 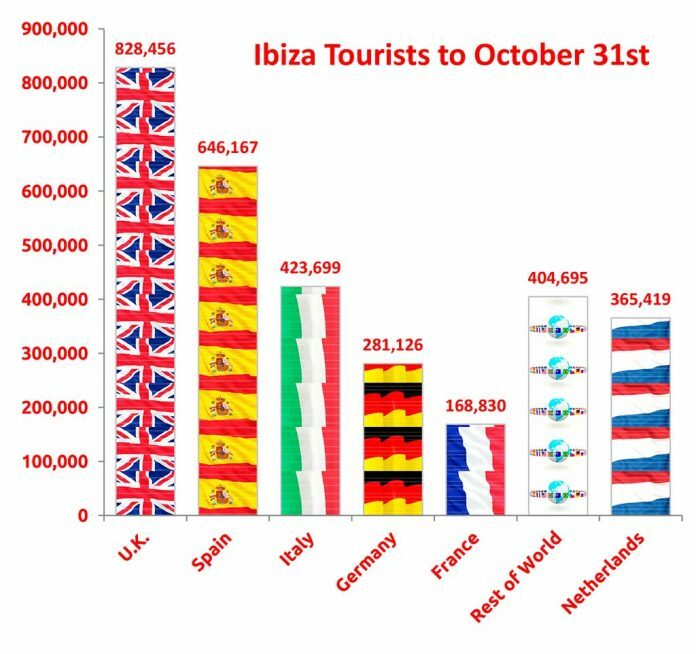 Ibiza’s 3,141,934 officially recorded tourists to the end of October was down on 2017, but still ahead of the 3,007,658 recorded in 2016. A question we know will be asked of many working in the tourist sector, is can that possibly be right? Many businesses in Ibiza have reported downturns far in excess of such a modest reduction. We make no absolute judgement here. We are reporting the official figures of FRONTUR as published by the Balearic Statistics institute. However, it should be remembered that these figures relate to the number of tourists only. It takes no account of the duration of their stay, the type of accommodation or package they booked, nor of their spend once here. We will soon publish a statistical report combining several sources of data, which we hope will give a true overview. The British continued to be by far the biggest single tourist source, though their numbers overall did drop by 4.5% – a surprising outcome as our statistics for peak season showed the British ratio for the busiest part of the season had actually increased. 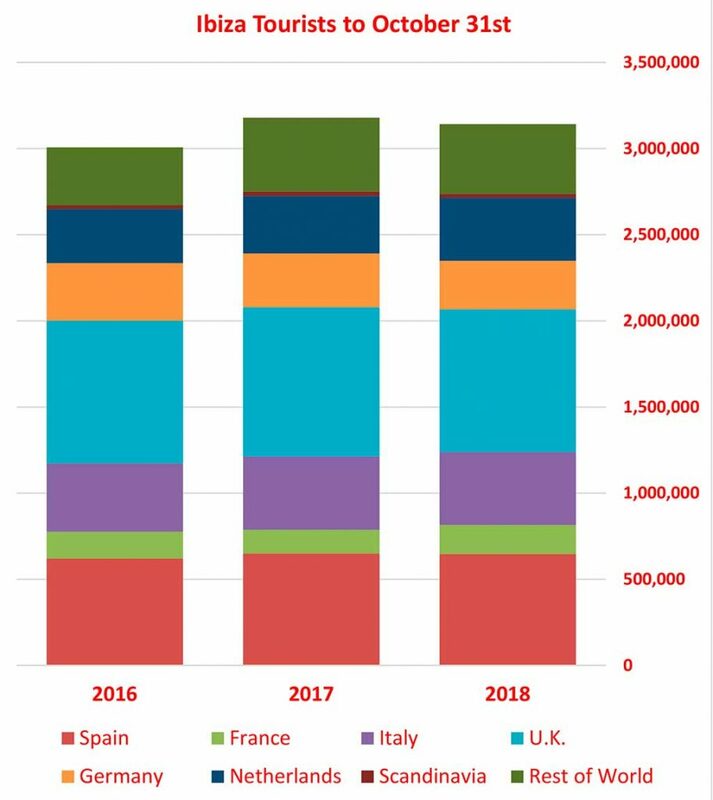 The French show an increase in business out of sync with all other nationalities, though their overall figures are very low and so it has little impact on the overall number. The Dutch also continue their love affair with an increase of near 10%, solidifying their 4th place behind the U.K., Spain and Italy. Aside from the French and Dutch it is a drop across the board. The German market continues in sharp decline, despite hopes by Ibiza’s Tourist chiefs that they had stopped the rot. Any reference to the french and Dutch gaining ground due to a German retreat would likely result in accusations of never letting the war go, and so have no place here. The current collection method of the Frontur statistics have been in place since 2016, so that is as far as we can go back in comparison. Though 2018 may have seen a slight reduction – and if it were just 1.2% of overall business many of us would say that was a good thing as the island’s infrastructure was reaching breaking point – but overall it is only the Germans who show any meaningful drop on the 2016 figures. OK the British are technically down, but only by a couple of Easyjet flights. 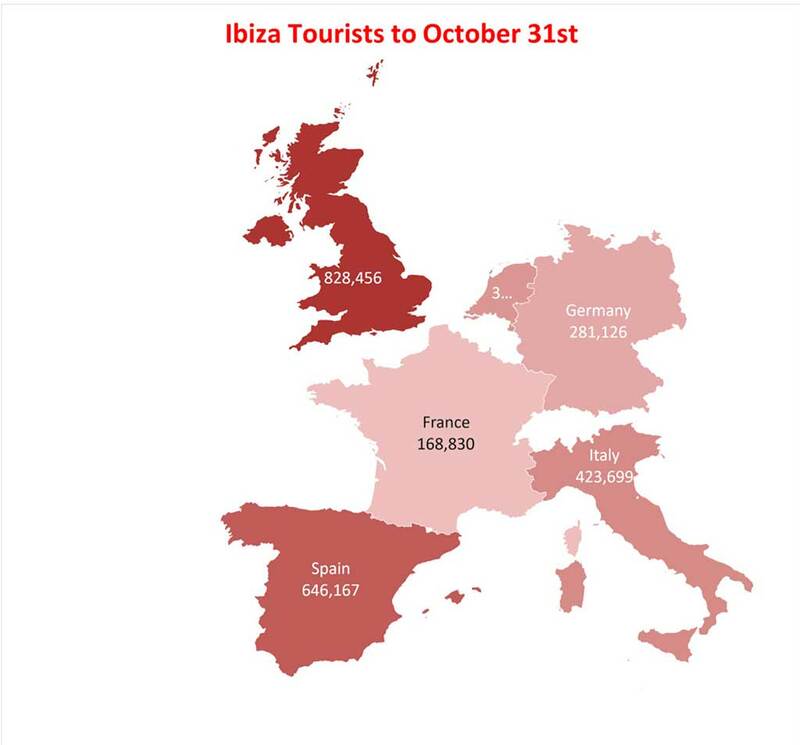 Writing this report i cannot help feeling that these numbers fall far short of the conclusive evidence we may have expected of any end of year Ibiza tourism statistics. A 1.2% overall drop will receive disbelief in some who will have expected a greater drop. Others will see it as proof of there being no need to panic – it’s business as usual. And those looking at the figures from a perspective of sustainable tourism will likely consider this modest drop far too little to help in their cause. These numbers will do little to create movement from a person’s position of ‘tourist’s go home’, nor ‘disregard tourism at our peril’. Perhaps our project of combining figures will reveal some greater insight. But as it stands, a figure of a 1.2% drop, which could even conceivably be offset by a good November and December to a position of absolute zero, may do little more than perpetuate the same ‘where are we heading?’ argument for at least one more year.